Background and objectives Recent guidelines suggest that patients should be evaluated after AKI for resolution versus progression of CKD. There is uncertainty as to the role of nephrologists in this process. The objective of this study was to compare the follow-up recommendations from nephrologists with contemporary processes of care for varying scenarios of patients hospitalized with AKI. Design, setting participants, & measurements We surveyed Canadian nephrologists using a series of clinical vignettes of patients hospitalized with severe AKI and asked them to rank their likelihood of recommending follow-up for each patient after hospital discharge. We compared these responses with administrative health data on rates of community follow-up with nephrologists for patients hospitalized with AKI in Alberta, Canada between 2005 and 2014. Results One hundred forty-five nephrologists participated in the survey (46% of the physician membership of the Canadian Society of Nephrology). Nephrologists surveyed indicated that they would definitely or probably re-evaluate patients in 87% of the scenarios provided, with a higher likelihood of follow-up for patients with a history of preexisting CKD (89%), heart failure (92%), receipt of acute dialysis (91%), and less complete recovery of kidney function (98%). In contrast, only 24% of patients with similar characteristics were seen by a nephrologist in Alberta within 1 year after a hospitalization with AKI, with a trend toward lower rates of follow-up over more recent years of the study. Follow-up with a nephrologist was significantly less common among patients over the age of 80 years old (20%) and more common among patients with preexisting CKD (43%) or a nephrology consultation before or during AKI hospitalization (78% and 41%, respectively). Conclusions There is a substantial disparity between the opinions of nephrologists and actual processes of care for nephrology evaluation of patients after hospitalization with severe AKI. Approximately 500 of every 100,000 adults are hospitalized with AKI each year in North America (1), and this incidence continues to rise, whereas in-hospital mortality is simultaneously declining (2,3). As a result, there is a growing risk of adverse long-term consequences after AKI, including the development or progression of CKD (4–6). On the basis of several studies that reported heightened risks of CKD after AKI, the Kidney Disease Improving Global Outcomes (KDIGO) clinical practice guideline for AKI highlighted the importance of clinical follow-up for CKD after AKI, including specific recommendations for re-evaluation of patients 3 months after AKI for resolution, new onset, or progression of CKD (7). However, little is currently known about the factors that influence community follow-up of patients after AKI or the characteristics of patients who do versus do not receive subsequent re-evaluation of kidney disease in the community. This information is potentially useful to develop strategies to improve transitions in care between the hospital and community after an episode of AKI. The purpose of our study was to characterize the opinions of nephrologists about factors that influence their likelihood to recommend follow-up for patients after a hospitalization with AKI and compare these opinions with current processes of care after hospitalization with AKI. We distributed an electronic survey of clinical vignettes through the Canadian Society of Nephrology newsletter to Canadian nephrologists after the publication of the KDIGO clinical practice guideline for AKI (7). The Canadian Society of Nephrology included 315 active nephrologist members at the time of the study. The survey was disseminated by email as part of the Canadian Society of Nephrology newsletter in September of 2012. Follow-up emails to encourage participation were sent out to members in November of 2012, and the survey officially closed on December 31, 2012. We provided the survey in an electronic format using the online software FluidSurveys (http://fluidsurveys.com). After consent was obtained, we provided each participant with a series of questions on the basis of five clinical vignettes of patients with KDIGO stage 3 AKI and asked them to rank the likelihood that they would subsequently follow-up or recommend testing of kidney function (eGFR) after discharge. (Supplemental Material). Scenarios varied by patient age, presence of heart failure, preexisting CKD, whether the patient received temporary dialysis, and the degree of recovery of kidney function (eGFR) at the time of hospital discharge. We measured responses on a five-point modified Likert scale, including one (definitely not), two (probably not), three (unsure), four (probably would), and five (definitely would), and determined the proportion of responses within each category. We analyzed results, including all variables, in univariable and multivariable ordinal logistic regressions with a clustered sandwich estimator of variance to account for correlation of responses within individuals. We tested the parallel regression assumption, which indicated no violation of the proportional odds assumption (Brant test P=0.78). Common odds ratios could thus be reported for each of the variables on the basis that they could be considered generalizable to all possible cut points where ordinal responses (from the five-point Likert scale) could be dichotomized (e.g., one versus two, three, four, or five; one or two versus three, four, or five; one, two, or three versus four or five; one, two, three, or four versus five). To compare the findings obtained from the responses to clinical vignettes with current processes of care in Alberta, we also performed a cohort study using linked administrative data to examine frequency and variables associated with nephrologist follow-up. We defined KDIGO stage 3 AKI as a greater than threefold increase or serum creatinine >4.0 mg/d per liter with an acute increase of >0.3 mg/dl from the preadmission level. The cohort included Alberta residents ages ≥18 years old hospitalized with KDIGO stage 3 AKI from May 1, 2005 to March 31, 2014. We restricted the cohort to individuals not on dialysis or not with a prior kidney transplant or a baseline eGFR <15 ml/min per 1.73 m2 before hospitalization who survived without rehospitalization for at least 90 days after discharge. We identified death from Alberta Health registry files and dialysis or kidney transplantation from the Northern and Southern Alberta Renal Programs. AKI was determined using all serum creatinine measurements obtained from the Alberta Kidney Disease Network repository (8), with baseline kidney function determined on the basis of the mean serum creatinine in the year before hospitalization. We defined eGFR using the Chronic Kidney Disease Epidemiology Collaboration Study equation (9), and we defined preexisting CKD by values <60 ml/min per 1.73 m2 on the basis of the mean of all outpatient serum creatinine measurements taken between 1 year and 1 week before the hospital admission. Age at time of hospital admission was obtained from the registry files of Alberta Health. Comorbidities and procedures were identified from hospital discharge records and physician claims with validated International Classification of Diseases, Ninth Revision, Clinical Modification and International Classification of Diseases, Tenth Revision coding algorithms using codes associated with encounters in the 3 years before the index hospital admission for preexisting conditions (10). We identified the receipt of dialysis for AKI on the basis of a validated diagnostic coding approach requiring a diagnosis code for AKI and procedure code for dialysis applied to the hospital discharge record (11). We identified the degree of recovery from AKI in hospital on the basis of the last serum creatinine measurement available before hospital discharge and expressed it as a percentage above the baseline serum creatinine measurement (last serum creatinine before index hospital admission). Physician contacts before and after AKI hospitalization were identified from physician claims from Alberta Health within 1 year before, during, and 1 year after hospitalization. We identified the proportions of patients who received follow-up with a nephrologist and non-nephrology physicians within 1 year of discharge according to the same set of patient characteristics provided in the clinical vignettes, which were included in multivariable logistic regression models to examine the associations between these characteristics and the odds of nephrologist follow-up. We performed all analyses using the SAS and R Statistical software (12). Model assumptions were tested and met for all analyses. The study was approved by the Conjoint Health Research Ethics Board at the University of Calgary. Of 315 active members of the Canadian Society of Nephrology, 195 accessed the electronic survey, and 145 (46%) completed at least one vignette contributing to the results. Of those, 131 (90%) participants completed all scenarios. The characteristics of respondents are shown in Table 1. In total, 76% of respondents reported being in clinical practice for <20 years, and over 70% of respondents described working in an academic practice. Figure 1 summarizes the responses of nephrologists from the clinical vignettes. Most nephrologists indicated that they would definitely follow-up the patients described in the vignettes, regardless of these variables. Notably, respondents were less likely to indicate that they would follow-up with patients whose kidney function fully recovered to preexisting levels. Nephrologists surveyed indicated that they would definitely or probably re-evaluate patients in 87% of the scenarios provided, with responses for definite or probable follow-up ranging from as high as 98% for patients with the least recovery of kidney function. Disparity between Nephrologists' Opinions and Contemporary Practices for Follow-up after AKI Hospitalization. 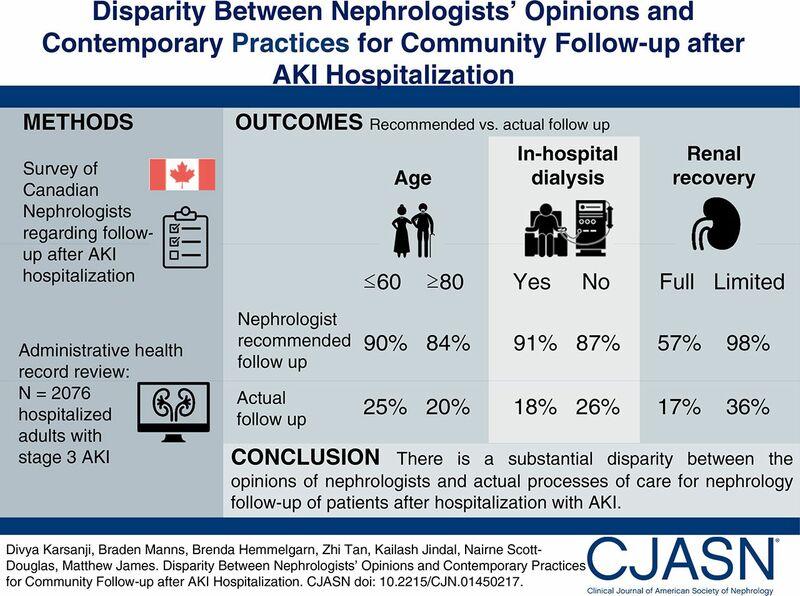 The figure showns the opinions of 145 Canadian nephrologists who completed a survey on follow-up after AKI hospitalization versus observed practice for community follow-up within 1 year after hospitalization with AKI in Alberta, Canada between 2005 and 2014 according to specific patient characteristics. (A) Nephrologists’ responses to the survey questions about whether a patient should receive nephrology follow-up are shown with the colored bars for each of the specified patient characteristics. (B) The proportions and associated 95% confidence intervals (95% CIs) of those patients who received nephrology follow-up in the community in Alberta in the cohort study between 2005 and 2014 are shown with black squares and lines, respectively, for each of the specific patient characteristics. In multivariable ordinal logistic regression models adjusted for all variables examined, preexisting CKD and the receipt of acute dialysis were associated with 43% and 60% higher odds of recommending follow-up, respectively (Table 2). Nephrologists reported threefold higher odds of arranging outpatient follow-up for patients with a serum creatinine 20%–60% above previous baseline at hospital discharge compared with for patients who experienced full recovery of kidney function. The odds of recommending outpatient follow-up were tenfold higher in patients whose discharge serum creatinine was 60% above their baseline value from before hospital admission compared with patients who experienced full recovery of kidney function. Physicians in academic practice were less likely to indicate that they would arrange outpatient follow-up than those in private or other practice. When the scenarios were altered to ask nephrologists whether they would recommend follow-up outpatient assessment of kidney function, similar results were observed. In adjusted ordinal logistic regression models, nephrologist reported higher odds of recommending follow-up kidney function testing in patients who received acute dialysis or those without recovery of kidney function (Supplemental Table 1). We identified 3595 adults who were 18 years old or older, did not have preexisting ESRD, and were hospitalized with KDIGO stage 3 AKI in Alberta between May of 2005 and March of 2014. We excluded 1142 individuals who died, remained on dialysis, or were readmitted up to 90 days after hospital discharge and 377 individuals with eGFR<15 ml/min per 1.73 m2. The final cohort included 2076 patients who had KDIGO stage 3 AKI and survived at least 90 days without readmission. The baseline characteristics of the cohort are shown in Table 3. Overall, 24% of patients were seen by a nephrologist in the year after discharge, including only 18% of those with AKI who received acute dialysis in hospital. Patients who received nephrology follow-up were younger and less likely to have cancer but were more likely to have preexisting CKD, higher discharge serum creatinine, lesser recovery of kidney function, and prior nephrology consultation (both before or during the AKI hospitalization). The percentage of patients who received nephrology follow-up varied according to patient characteristics (Figure 1). 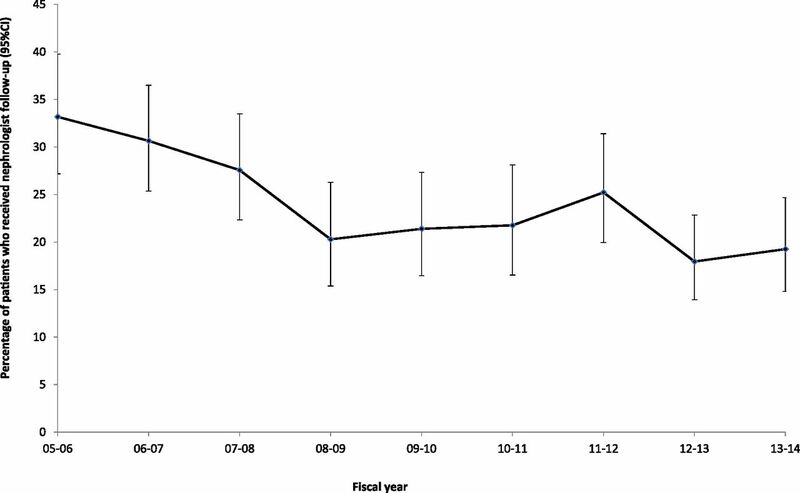 There was a trend over time toward a lower percentage of patients receiving nephrology follow-up (Figure 2) (P value trend =0.01), with fewer patients seen in follow-up by nephrologists after (fiscal years 2012–2014) versus before (2005–2012) publication of the KDIGO AKI guideline (19% versus 26%; P<0.001). In multivariable logistic regression models, patients older than 70 years old were significantly less likely to see a nephrologist in the year after discharge, whereas those with preexisting CKD or prior nephrology consultation before or during AKI hospitalization were significantly more likely to be seen by a nephrologist in follow-up (Table 2). Temporal Decline in the Percentage of Patients Receiving Nephrology Follow-up after AKI Hospitalization. The figure shows percentages, with accompanying 95% confidence intervals (95% CIs), of patients who received nephrology follow-up in the year after AKI hospitalization in Alberta, Canada according to fiscal year. Patients who received nephrology follow-up were more likely to have at least one serum creatinine measurement within 90 days after hospital discharge (92% versus 65%; P<0.001). Almost all patients had follow-up with at least one other non-nephrologist physician in the year after hospital discharge (99% versus 99%; P=0.27), with no difference in the total number of physician visits in the year after discharge between the two groups (median =18; interquartile range, 10–30). There were no differences in all-cause mortality (7% versus 8%; P=0.30) or hospital readmissions (26% versus 26%; P=0.82), but there was a higher percentage of patients started on chronic dialysis treatments (5% versus 0%; P=0.02) between 90 days and 1 year for patients who received nephrology follow-up. In our survey of Canadian nephrologists, we found that the majority indicated that community nephrology follow-up should occur for most patients after hospitalization with severe AKI. However, our examination of real world practice showed that a minority of such patients currently receive follow-up with a nephrologist in Alberta. Several patient factors, including preexisting CKD and incomplete recovery of kidney function, were associated with nephrologists expressing greater importance of follow-up in the survey, which corresponded with a higher frequency of follow-up in actual clinical practice. However, less than one quarter of all patients with severe AKI received community follow-up with a nephrologist specifically in Alberta. These results suggest that current processes of care after hospitalization with severe AKI fall short of what many nephrologists express as ideal. For many acute illnesses with the potential for chronic sequelae (e.g., myocardial infarction and heart failure), community follow-up with specialists is regarded as an important process of care after hospital discharge (13–15). Comparatively little research has been done to understand the significance or importance of nephrologist follow-up after hospital discharge of patients with AKI. Siew et al. (16) studied 3929 patients in the United States with AKI stages 1–3. Over the subsequent year, the cumulative incidence of nephrology follow-up was 8%. Patients who did not receive follow-up were older, were less likely to have diabetes mellitus, and had a higher baseline eGFR. However, 87% of this cohort had AKI stage 1, and most patients recovered kidney function during follow-up, suggesting that long-term sequelae and factors that may necessitate nephrology follow-up were rare in this cohort. In another study from Ontario, Canada, Harel et al. (17) reported that 41% of patients with AKI who received acute dialysis in the hospital saw a nephrologist in follow-up within 90 days of hospital discharge. Patients who received nephrologist follow-up were more likely to have preexisting CKD, hypertension, and visited a nephrologist before their admission to hospital with AKI. In a study from the United Kingdom, Khan et al. (18) identified that 22% of patients with AKI received nephrology follow-up. After excluding patients deemed at low risk of progression to ESRD due to advanced age or with malignant disease, the incidence of patients referred for follow-up increased marginally to 34%. Although our study shows a similar low rate of nephrologist follow-up after AKI to that in these observational studies, our study contrasts the relatively low rate of follow-up with nephrologist’s opinions on the importance of follow-up, including among patient subgroups for which nephrologists indicate the greatest importance. Our study has limitations. First, physician participation in the survey was voluntary, with no incentives or requirements for participation, and may be vulnerable to nonrespondent bias. 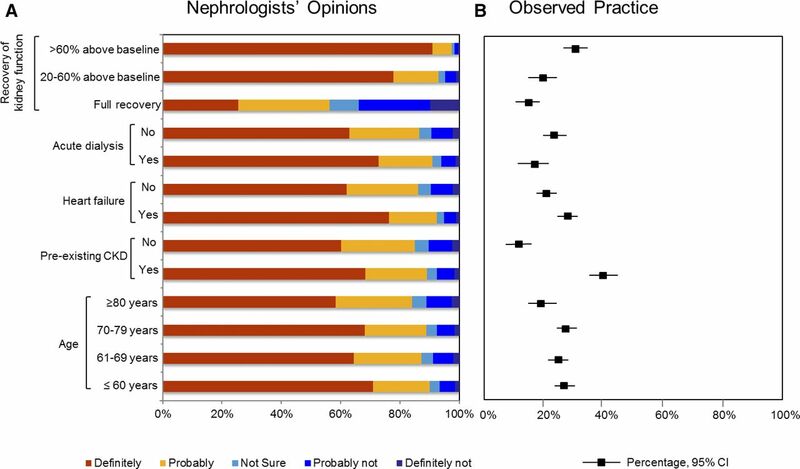 Although 46% of members of the Canadian Society of Nephrology responded the survey, 70% were from academic centers, and their responses significantly differed from nephrologists in private or other practice, suggesting that responses may not be generalizable to opinions of all nephrologists. However, the survey response rate and characteristics of participants were consistent with those of other recent surveys of Canadian nephrologists (19). Second, our study focused on follow-up for nephrology care. Follow-up after AKI could also be provided by primary care physicians or general internists, who may also play an important role in community care. We observed that 99% of patients who did not receive nephrology follow-up were seen by at least one other physician within a year of discharge, suggesting other opportunities for physician follow-up. Third, our study lacked information about clinical recognition and decision making to fully explore the additional patient-, provider-, and system-level barriers to follow-up after AKI. Fourth, our examination of real world processes of care was restricted to Alberta, and processes of care may differ in other regions. Fifth, our survey was conducted in 2012, and there is potential for changes in current day thinking. However, we observed a temporal decline in nephrology follow-up rates in our observational data, suggesting that nephrology follow-up after AKI has not increased in recent clinical practice subsequent to the publication of the KDIGO AKI guideline. Our study highlights gaps between what nephrologists express as desirable follow-up after severe AKI and what actually occurs. Our findings also identify potential barriers to nephrology follow-up that may explain this discrepancy. For example, patients who did not receive nephrology follow-up were less likely to have seen a nephrologist before hospitalization or during the hospitalization with AKI. However, most patients received follow-up with at least one other physician in the year after hospital discharge, and many had frequent physician contacts in the year after discharge. These findings suggest that strategies to increase awareness among non-nephrology physicians of long-term risks associated with AKI and prompt appropriate referral to nephrology providers may facilitate subsequent transitions to community nephrology care. In addition, we found that serum creatinine testing within 3 months of hospital discharge was performed in 72% of patients who did not receive nephrology follow-up, which was a significantly lower rate than that in patients who received nephrology follow-up and lower than what nephrologists recommended in the vignettes examined. Communication of recommendations for follow-up of kidney function to care providers at the time of hospital discharge to the community is another strategy that might help overcome this discrepancy. We acknowledge that the role of nephrologists in following up patients after AKI remains incompletely defined. Nephrologists may play a number of roles in the follow-up of patients after severe AKI. These could include monitoring kidney function; management of related metabolic and volume status abnormalities; medication reconciliation; facilitating recovery and/or reducing the risk for further AKI; and implementation of evidence-based CKD management strategies (including use of angiotensin converting enzyme inhibitors or angiotensin receptor blockers in the setting of proteinuria, diabetes, and heart failure), statin use in patients with CKD or cardiovascular disease, and education and preparation surrounding various treatment options for ESRD. Further research is important to identify the most appropriate and efficient strategies to provide high-quality care after AKI, including the respective roles of nephrologists and primary care physicians (20). In summary, we found that nephrologists expressed that nephrology care in the community was important for many patients after hospitalization with AKI. However, only a minority of such patients actually received follow-up with a nephrologist after AKI. Further studies are needed to evaluate the effect of longitudinal follow-up after AKI on processes of care and clinical outcomes, including testing of established CKD management strategies to determine whether such approaches can improve adverse long-term outcomes of AKI. B.J.M. is supported by the Svare Professorship in Health Economics and a Health Scholar Award by Alberta Innovates Health Solutions. B.R.H. is supported by the Roy and Vi Baay Chair in Kidney Research. M.T.J. is supported by a New Investigator Award from the Canadian Institutes of Health Research. This study is, in part, on the basis of data provided by Alberta Health and Alberta Health Services. The interpretation and conclusions contained herein are those of the researchers and do not necessarily represent the views of the Government of Alberta or Alberta Health Services. The Government of Alberta, Alberta Health, and Alberta Health Services do not express any opinion in relation to this study. This article contains supplemental material online at http://cjasn.asnjournals.org/lookup/suppl/doi:10.2215/CJN.01450217/-/DCSupplemental.